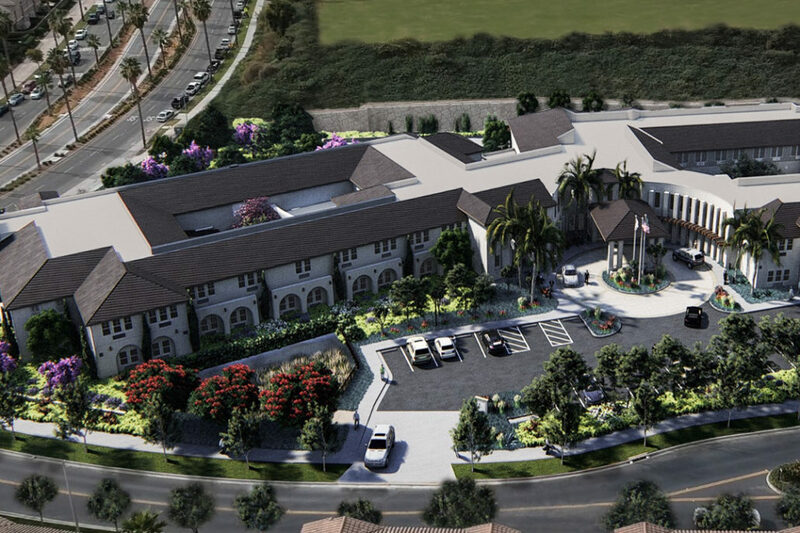 “Senior housing will be the next hot real estate market.” So says Douglas Wilson, chairman and CEO of Douglas Wilson Companies (DWC), which has become a major developer of senior-housing facilities in the San Diego market. Reflecting its recognition of the Silver Tsunami — the large wave of baby boomers becoming seniors — the firm recently launched its first ground-up project, Sienna at Otay Ranch, the first of a portfolio of such properties planned in the Western region, according to a representative of the firm. Located at 1290 Santa Rosa Drive in the Otay Ranch neighborhood of Chula Vista, the project is an up-market senior-housing brand whose first residents began moving in in October 2018, with an official grand opening in November 2018. The $31 million, 110,000 square-foot Sienna at Otay Ranch offers a total of 111 units with 127 beds: 85 apartments for assisted living and 26 for memory care. Just like in other sectors of CRE, high-end amenities are critical to today’s senior-housing facilities, so the complex will offer a 7 a.m. to 7 p.m. full-service, white-tablecloth restaurant; outdoor dining; community garden; courtyards; bistro; juice bar; library; fitness area; reading and game rooms; movie theater; beauty salon and barbershop; and a regularly scheduled onsite nurse practitioner. Milestone Retirement Communities will handle all management responsibilities for project. Two other senior-housing properties for DWC’s senior-housing were in final negotiations as of late October. According to the representative, Sienna at Otay Ranch is just the first in a series of long-term senior-property holds for DWC, which has announced its intention to build five to eight of these up-market senior communities over the next five years and grow the brand into the future. The company’s whose current business platforms include a strategic focus on the needs and opportunities associated with the demographics of America’s aging population. The move to senior housing is a departure for Wilson, but he is no stranger to shapeshifting. In the 1980s, Wilson created the 35-story Symphony Towers, a renovation of San Diego’s symphony hall within the walls of a mega-commercial and hotel complex, which takes up a full city block in Downtown San Diego and remains an icon to this submarket. Two other Wilson icons — The Mark and Park Loft — have also made their mark Downtown. The two condominium buildings have complemented San Diego’s recently built ballpark Petco Park, which has revitalized the east side of town. And, when the Great Recession hit, Wilson turned to handling workouts nationwide, transforming his company into one of the country’s most prominent receivers, trusted by private investors, banks, and government to reposition or sell troubled assets. According to the profile, complementing its development and asset-management practices, DWC continues to offer real estate advisory services, working with large private, public and non-profit institutions. Through these services, DWC evaluates and retools existing land and business plans to help clients maximize opportunities in today’s marketplace. Two parts of Southern California will be hit the hardest, he says: the urban centers (Los Angeles, San Diego, and Orange County) as well as rural areas that have large, multi-generation agricultural holdings. There are many private and institutional lenders and investors that are well aware of the need for this type of housing, and if they aren’t invested in this class, they’re starting to look at it seriously, Wilson notes. Part of the reason for this is how senior-housing properties have changed over the decades. “Today’s facilities don’t look anything like what was built 30 years ago and don’t carry the stigma that accompanies older properties,” Wilson says. “What we’re building now is a direct reflection of what the market is demanding. Today’s ‘seniors’ are more active, more independent, so their housing reflects that individuality. They want lots of amenities and conveniences (coffee shops, on-site medical care, gardens, etc. ).